Find hotel near Biserica Sfantul Gheorghe .. This truck is of great historical importance. It is not new by any means, having been built in 1707. It's mostly popular as the last resting place of Wallachian prince Constantin Brancoveanu, whose remains can be seen here. There is also a statue of the prince in the courtyard. The paintings on the exterior and interior are superb, especially the murals. Also at the church are the relics of Saint Nicholas (a hand), a couple of miraculous icons. By Trams 5, 16, 21 stop Piata Sf. Gheorghe. By Bus 381 stop Piata Sfantul Gheorghe. How popular is Biserica Sfantul Gheorghe Nou? People normally club together Curtea Veche and Radu Voda Monastery while planning their visit to Biserica Sfantul Gheorghe Nou. Wonderful church, unfortunately a lot of beggars. But don't hesitate, visit it! And also other churches in Bucharest, you have a lot to see! A perfect cover for money laundry! Full of legal social and economical leeches! A really great place to charge your spiritual "batteries"! Amazing frescos, beautifully ornate and well maintained church. it's a shame this money couldn't be spent on the swathes of homeless people outside the church and all the beggars in Bucharest. It's worth visiting. 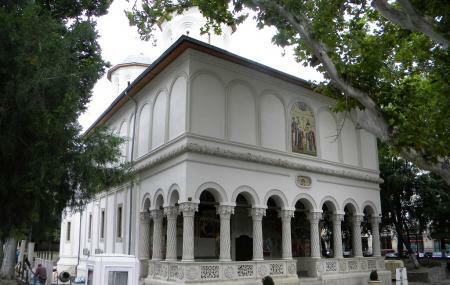 Not the usual orthodox church that you can find in Georgia, Greece or Russia.